If you have trouble getting to sleep, no matter how much you toss and turn or what position you try, you may have restless legs syndrome (RLS). According to the Mayo Clinic, every year more than 3 million people in the U.S. are diagnosed with restless leg syndrome, which has no cure. Those who suffer from it experience different symptoms and degrees of RLS, but most describe it as a very unpleasant and overwhelming urge to move their legs. Waking up in the middle of the night with painful leg cramps is also commonly reported and while the disorder mainly shows up in the legs, it can affect the head, arms, torso, and other parts of the body as well. RLS is caused by disturbances in the nervous system and the disruptions can make a person's legs and limbs jerk suddenly and move uncontrollably. The neurological disorder causes one to feel achy, strained, and painful, and it really just makes life miserable. Symptoms typically show up at night when people are sleeping or laying down attempting to fall asleep, which disrupts overall sleep patterns and drives sufferers even more crazy. The strange sensations people have reported feeling, like “an itch you can't scratch” or something “crawling” on them, are only alleviated when they get up and move around, hence the term restless leg syndrome. While there is no officially recognized medical cure for RLS, there does exist an all-natural treatment method that many people have found to be quite effective. All that it calls for is a simple bar of soap. Use a fresh bar that's preferably unscented but any brand or kind will work so long as it's new and not old or dried out. 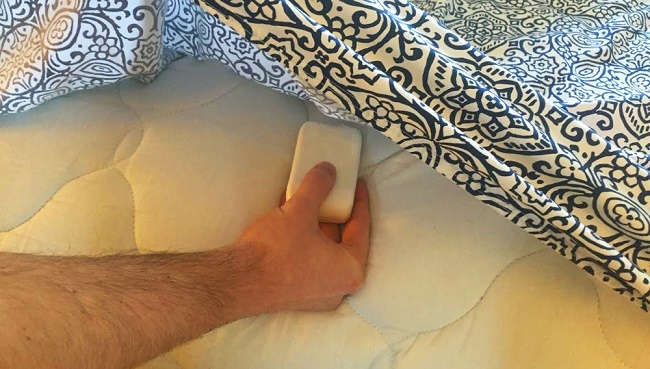 Stick the soap in-between the sheets or under the bottom fitted sheet and leave it there. Some people prefer to place the bar in a clean sock first to both protect their bed sheets and allow it to move around more freely. Either way is fine so choose what works best for you. After a month goes by check the soap bar to see how it looks, if it's shriveled up and dried out then it's old and needs to be replaced with a fresh one. In the alternative, you can simply scrape off the outermost surface portion to reveal a fresh layer underneath. The key is to keep the bar fresh at all times because it's believed that this method works by the soap releasing ions as it dries out. Once it's all dried up, it stops working and releasing ions, and is therefore no longer effective. While no scientific studies or research that explains, supports, or disproves the soap theory currently exist, a basic online search reveals countless testimonials from people all around the globe who swear by it. They claim that after sleeping with a bar of soap their excruciating, painful leg cramps and other unbearable RLS symptoms quickly disappeared all together, or at least enough to where they could sleep comfortably again. All they had to do was place a bar of soap in their bed sheets, sit back, relax, and let it do its magic. If you have RLS or issues with leg cramps, then try this method tonight because there's nothing to lose and potentially lots to gain from it, like better sleep quality and more comfort. It's cheap, easy, and reportedly very effective. Even if this home remedy doesn't work for you at least you won't be out hundreds of dollars, which is what a new mattress or alternative treatments and medicines can easily end up costing. If anything all that you'll end up with is an extra bar of soap!